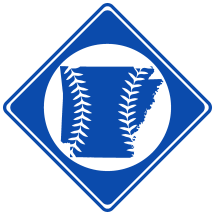 The First Intercity Baseball Game in Arkansas was played between the Rock City and Pine Bluff Base Ball Clubs on July 4th, 1868. The game was played at the Rock City Grounds in Little Rock, AR. On June 22nd, 1868, the State of Arkansas was readmitted into the Union, making a total of 28 states in all. Only 13 days later, the state celebrated its first Independence Day as a member of the United States since before the state had succeeded and joined the Confederacy 8 years earlier. By then, the number of states in the country had increased to 30. Florida and North Carolina had both been admitted in the days following Arkansas. All across the country, citizens were celebrating, and for good reason. It was the country’s 92nd birthday, and the nation was coming back together. In Arkansas’ capitol of Little Rock, the people wanted to celebrate in an “appropriate and becoming manner”, and in what way better than by playing a match game of the Nation’s Pastime and Little Rock’s newest social event, Base Ball. For a little more than a year, base ball had been increasing in popularity in Little Rock. Back in May, 1867, the first recorded game in the entire state took place at the Arsenal Grounds in Little Rock between the Pulaski and Galaxy Base Ball Clubs. Soon, other teams sprang up in the area too, including the Guidons, Dixies, and Mutuals, as well as a team at St. John’s College. But the most popular and successful team of the era was the Rock City Base Ball Club. It was this team that won the July 4th, 1868 base ball game, a game that would later be called “the most exciting contest of athletic sports ever witnessed in the state”. Several days before the game, John Brooker, a 23-year old office clerk and secretary of the Rock City club, sent a letter to a base ball club in Pine Bluff. He invited the club to come up and play the Rock Citys that Independence Day. Shortly afterward, the Pine Bluff club accepted, and the match was set. Excitement quickly grew in Little Rock. The upcoming game was featured in the local papers, which encouraged readers to come out to Rock City’s base ball grounds to see the game. Located at the head of Scott Street in Little Rock, the grounds were the site of most of the local games. Of course, due to a lack of electricity, the game would be played during the afternoon. To help keep the spectators shaded from the July sun, awnings were erected at the grounds, as were seats for several hundred. For the teams specifically, a tent was put up to use during the game like an early form of a dugout. The day of the nation’s anniversary and the match game quickly came. The Pine Bluff Club, composed of a selected group of nine players from two of the city’s clubs, arrived in Little Rock a couple days before, attracting quite a bit of attention. After all, never before had a team from a different section of Arkansas traveled to play a rival team in a different city. At 3 o’clock on the day of the celebration, the two teams showed up at the base ball grounds. Clerks, accountants, lawyers and volunteer firefighters wearing white flannel pants and shirts with a red “R. C.” on the chest made up the Rock City club, while the Pine Bluff players, most of whom were farmers, donned black pants and white shirts featuring a red star. At 3:25, Edward P. Bishop, a local contractor and umpire, called play. Pine Bluff had been given the choice of whether to bat first, but respectfully chose to go second. So, despite their status as the ‘home team’, Rock City was the first to came to the plate. The first two batters made quick outs, but Albert Bishop, the third batsmen, “made his run”, a term perhaps better known today as an inside-the-park homerun. However, that would be Rock City’s only run in the 1st. Pine Bluff did one better though, securing two runs to take an early lead. Four innings later, Pine Bluff still led by only one run, though the score now stood at 15-14. Umpire Bishop then called time after the 5th inning for a brief intermission. When play resumed shortly afterwards, Rock City came out swinging. They scored 11 runs right away, though their success was partly credited to the Pine Bluff’s pitcher, who was nearly exhausted due to the heat. But because he was the only pitcher on the club, he continued to pitch the rest of the game. In result, Rock City scored 29 runs in the final four innings. Pine Bluff held their own, tallying up 21 more, but after the 9 innings were complete, Rock City had a 43-36 victory. Three cheers were made, as well as a “tiger” for the umpire. The game ended at 6:30. During the 3 hours and 32 minutes played, 79 runs had been scored, though it was by the standards of the era, a “closely contested” game. The Pine Bluff club, winning much sympathy for their “gentle manly bearing” of the loss, were shown around town by the Rock City club following the game. It was generally expressed that with perhaps a little more practice, Pine Bluff would be able to defeat their opponent next time around, though no record shows the two teams ever met again. Rock City’s success continued when they went on to win the 1869 state base ball championship at the state fair. Shortly afterwards, they faded out of history. However, base ball continued to flourish in Little Rock. In 1886, the city got its first professional team, and in 1895, its first minor league team, still alive and well today as the Arkansas Travelers. But it was Rock City’s game with Pine Bluff that first set the tone for baseball’s popularity in Little Rock, and all of Arkansas.